Sunday August 26th 1889 I was working about the house all forenoon in the afternoon John and Hatt come over and we talked with them. Mother and I got supper and then Will and I went over to Folsoms to spend the evening had a pleasant visit. Lee got home from Newton last night where he had been in camp for the last week, an awful hot day. Monday August 26th 1889 We took up the dining and sitting room carpets and got them down again after mending them a great deal. We dried some corn and churned besides the other work. I had a letter from Willie Bremmer which I answered. Tuesday August 27th 1889 We washed this morning and put out some corn to dry. I went to town as soon as I ate my dinner and got new curtains for the dining room. Mother went over to Fannys late in the afternoon and stayed there all night. There was a sociable at Wood-lawn. Will and I went out in the evening. he was at the fair in the afternoon. I put up curtains and worked at house cleaning all afternoon. 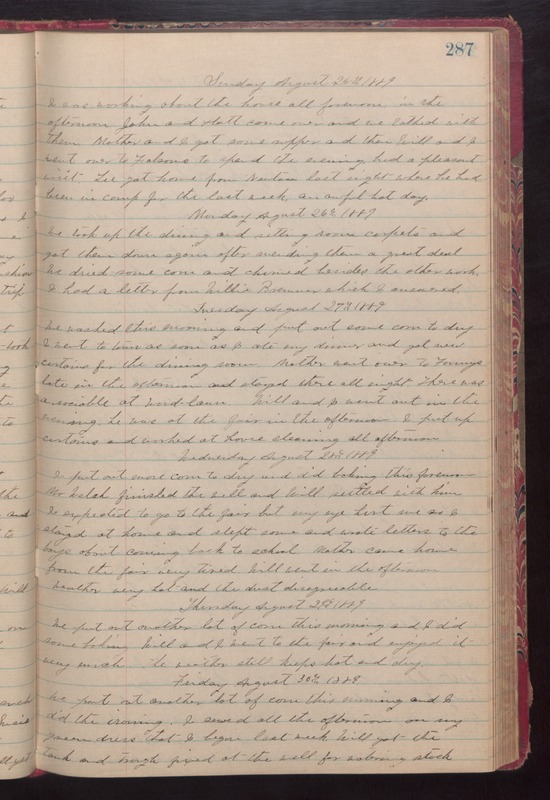 Wednesday August 28th 1889 I put out more corn to dry and did baking this forenoon. Mr. Welsh finished the well and Will settled with him. I expected to go to the fair but my eye hurt me so I stayed at home and slept some and wrote letters to the boys about coming back to school. Mother came home from the fair very tired. Will went in the afternoon weather very hot and the dust disagreeable. Thursday August 29th 1889 We put out another lot of corn this morning and I did some baking. Will and I went to the fair and enjoyed it very much. The weather still keeps hot and dry. Friday August 30th 1990 We put out another lot of corn this evening and I did the ironing. I sewed all the afternoon on my green dress that I began last week. Will got the tank and trough fixed at the well for watering stock.